The high capital cost of existing medium scale biochar kilns is a major barrier to the production of low cost biochar in developed and developing countries. To overcome these barriers, an alliance was formed between the Biochar Energy Systems—BES (a builder of biochar technology and producer of biochar and biochar mixes), Nanjing Agricultural University (China), Benenv Environmental Technologies Company (China), the University of Newcastle (Australia), associate professor Faris Christo at the University of South Australia, and Applied Gaia, to develop a transportable, low cost, low emission, multi-feedstock, continuous biochar unit that could be run by one person and that had an feedstock input of approximately 300 – 350kg/hr (at 15% moisture content). The unit was designed so waste heat could be utilized for heating animal sheds, greenhouses, aquaculture ponds, or crop/food processing plants. A target sales price for this unit is $US50,000 once large scale manufacture is achieved (although the present price is $US70,000). The initial concept was developed by Stephen Joseph in 2008 in collaboration with Cornell University (United States) for use in developing countries. 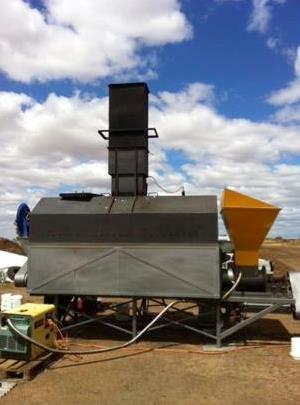 It is based on existing advanced biomass combustion systems that use augers to move the biomass feed through troughs. 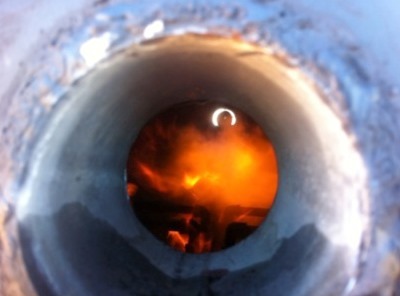 The pyrolyser was designed and built by BES and incorporates the experiences gained from a similar unit built by Nanjing University in 2012 (see: http://www.biochar-international.org/wp-content/uploads/2018/03/Commissioning_Open_Source_Twin_Trough_Pyrolyser_final.pdf). This mobile unit is designed to be used in the field and is mounted on a dual axle chassis. It comes complete with a 10kva diesel generator with a 32 amp, 3-phase outlet for motor drives and single 15 amp outlets for a water pump and Siemens “LOGO” Logic Module. The operation of the machine is based on a horizontal trough with solid steel plates on either side with an enclosed and double skinned combustion zone above it. Feed material is slowly moved along the trough with an auger that combines conventional spiral flights and paddles. The paddles stir the charring biomass and sweep it to the bottom of the trough, mixing it with the drying biomass. Primary air is introduced through the steel plates, with some pre-heating, and through two jets at the pyrolysis end wall. Secondary air is drawn through the double skinned combustion zone wall to clean exhaust gases. In operation, the syngas from pyrolyzing biomass in the trough and primary air mix are partially combusted above the bed. Radiant flux above the bed causes biomass to dry/torrefy and pyrolyze as the material moves along the trough. Secondary air flows over the hot inside of the double skinned combustion zone wall. This secondary air then enters the reactor at the outlet exhaust, and mixes with the remaining unburnt syngas. 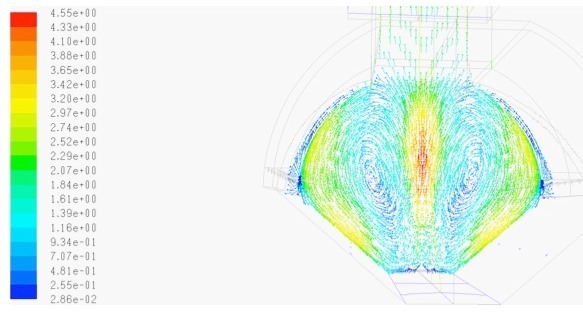 The temperature can be controlled by changing the feed rate, the flow rate of fine water droplets onto the charring bed, and the amount of primary air entering the chamber. 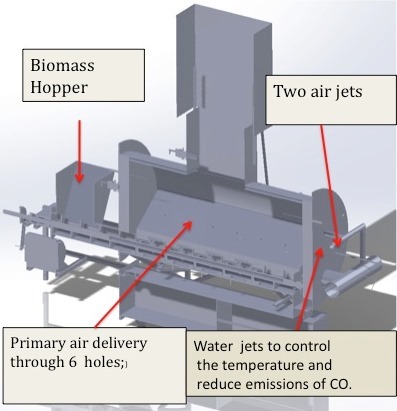 The unit is started manually and once operating temperature is reached, an industrial quality controller controls the desired temperature of the biochar and ensures efficient syngas combustion with the temperature in the reactor maintained above 800 degrees C.
Future work will involve scaling the unit up to 1 tonne/hour and having the capability of extracting clean syngas to run the engine. For further information please contact Russell Burnett at rwgb@appliedgaia.com or Sheila Macdonald at slmk@appliedgaia.com. Unit in Operation (all photos courtesy of the authors). High turbulence and efficient air syngas mixing results in clean efficient combustion. Modelling by Dr F Christo.